As you read a few of the hundreds of testimonials, you'll see that not only is Richard's book the best on the subject of skin parasites, but his amazing debriding soap is the best product in the market to deep clean your skin so it can function more normally. "This book and all the information Richard Kuhns has compiled literally saved my brother's life. The doctors couldn't help...they wanted to but they just do not have the focused research and expertise we were able to find in How To Get Your Life Back. From the correct diet to myriad treatments and how to deal with the medical community when you have skin parasites, there is no other single resource out there...THIS IS IT." "This book is an excellent resource with many helpful suggestions on how to deal with parasites. It is well referenced. The author is compassionate and honest. He shares his personal experience with parasites and how he has figured things out so that his life is normal. His book is positive, supportive, encouraging and gave hope to us." "Richard Kuhns has lived through this nightmare and gives you lots of tips on how to disinfect your house, car, workplace and body. Without him, I may well have committed suicide. Read the book and do what it says!!! Especially the eating plan. It takes 3 to 6 months or even a year to get completely well, but it does work." and skin protocol. I'm so glad I found Richard's book and skin protocol. I had been turned away by 4 doctors at the time and each said diagnosis of delusional parasitosis which is incredibly false! They want you to think this and exit the building quickly. 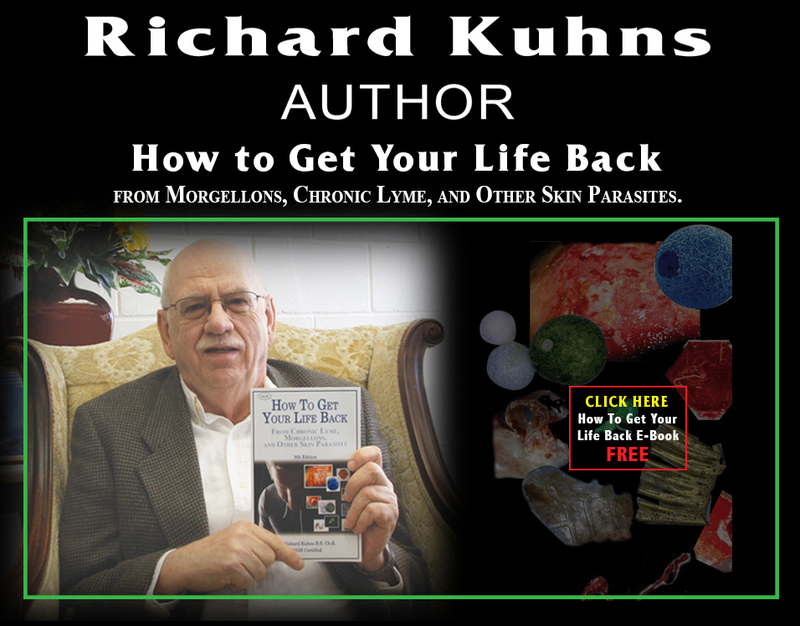 I did research and came across Richard's website and because he'd been through it already, he had gained the knowledge to help everyone get rid of those horrible parasites. If you strictly follow his guidance with diet, disinfection, and vitamins/supplements, you will get your life back!" "Fantastic research and knowledge, compassionate"